The Star Wars movies began their slow, intergalactic ascent into our collective subconscious on May 25, 1977, with the initial release of the enticingly titled Star Wars, Episode IV: A New Hope. I can remember glancing up at that enormous Panavision widescreen and being thoroughly enchanted, as well as confused, by the receding letters on that vast, blue-black star field. I distinctly recall wondering to myself, “Where the hell was I for the first three installments?” I was not alone in that regard. 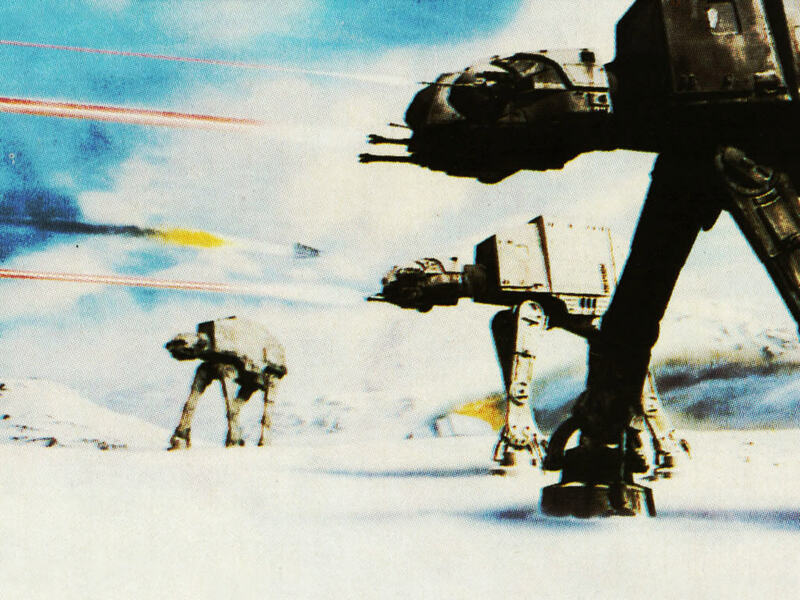 In fact, the next chapter in Twentieth Century-Fox’s financial juggernaut, Episode V: The Empire Strikes Back, followed soon thereafter on May 21, 1980, with the last entry taking another three years to complete, before Episode VI: Return of the Jedi was readied for release — again, on a lucrative 1983 Memorial Day weekend and on May 25, just as the first entry. Each picture in the series features a different director: Mr. Lucas (THX 1138, American Graffiti) for the first; the veteran Irvin Kershner (Return of a Man Called Horse, Never Say Never Again), a former film and photography student, for the second; and Richard Marquand (Jagged Edge, Eye of the Needle) for the third. Kershner and Lucas were fellow alumni at the University of Southern California (USC) Film School, where Irvin was tapped for his directing assignment. Director Marquand, on the other hand, was a writer and producer previously associated with TV programs, commercials, and mini-series in his native England. Politically, things were not so far advanced. When the original Star Wars epic premiered in May 1977, Democrat Jimmy Carter had already been sworn in as the 39th President of the United States — the proverbial “New Hope” for North America, politically speaking — just as the public outcry against the abuses of the Watergate scandal had toppled Republican Richard M. Nixon (the Evil Emperor) from power. After the affairs of Nixon and his equally nefarious cronies were over and done with, democracy was supposedly salvaged by a more benign figure (Master Yoda in human guise? ), one who was not only completely outside the established Washington, D.C. mainstream but straight out of the jilted backwater of a sleepy little town called Plains, Georgia — the proverbial “mud hole” of the Dagobah system, about as long ago and far, far away from the D.C. limelight as the planet Tatooine was from our home planet Earth. James Earl Carter was a genteel, born-again Christian — a peanut farmer, if memory serves me, and the former governor of Georgia. In retrospect, Carter wasn’t quite the sort of leader the country required at the time in order to confront the burgeoning Soviet arms buildup and advancing Red menace. Then again, neither was Obi Wan Kenobi, nor Luke Skywalker for that matter. Appearances can be deceiving. The Vietnam War had officially come to an end not two years prior. Yet Americans were still unable to come to grips with that disastrous episode in our history and its overpoweringly socio-political aftermath. The veterans of that unpopular exchange were not even granted a victory parade until a full decade or so later. To have been a Vietnam War veteran during those troubling times was not looked upon with pride or distinction. It was more in the nature of their having worn a Red Badge of Discouragement for serving in that conflict. With all that in mind, a young Southern California movie-maker named George Lucas began to slowly emerge as part of the new “advance guard” of a Vietnam-driven generation of film directors and writers that spawned the likes of Francis Ford Coppola, John Milius, Steven Spielberg, Oliver Stone, Paul Schrader, Martin Scorsese, and Brian de Palma. Though likely not the first of the breed, Lucas was perhaps the most adventurous of the bunch to have used the Vietnam War-metaphor (by way of classical mythology) as the principal underlying theme of his films; by showing what a hopelessly outnumbered band of courageous guerrilla fighters and their surprise hit-and-run tactics could do to undermine the efforts of a much larger, more unwieldy, and vastly superior Imperial Force — a reference to the United States of America, one would imagine. It was supposed to have been a foregone conclusion in the 1960s that the U.S. could defeat any foe at any time or any place; we would triumph in any military campaign against allegedly weaker, albeit undersized, enemy opponents such as the runty North Vietnamese, as the generals and military types of the era so pompously pointed out (forgetting the harsh lessons that the Korean campaign had taught us). Little did we know how wrong they truly were. If prior to 1977 the so-called New Hollywood had been obsessed with the social consequences of the Civil Rights movement, women’s liberation, the sexual revolution, film noir and its application of paranoia, distrust and feelings of dread, then the subsequent films in the Star Wars lineup went on to serve as prescient lessons in hubris, humility, lost causes, and old-time religion. George Lucas envisioned his fable purely as a morality tale of mythic proportions. It was destined to become a combination New Age Nibelungenlied and coming-of-age story starring a boyishly blond, teenaged Siegfried (our young friend, Luke Skywalker) for the “me” generation. Darth Vader was the Wotanesque father figure, with Jedi masters Yoda and Obi-Wan Kenobi playing the all-knowing, all-wise, behind-the-scenes architects of it all (Loge and Erda, respectively). As Lucas re-imagined it, each character had his or her own mythic archetype attached to his or her actions, brilliantly conceived and commented upon by author Joseph Campbell (The Hero of a Thousand Faces) and subsequently discussed at length in his now-classic television interview series, The Power of Myth (1988), with PBS journalist and former JFK speech writer, Bill Moyers. As both Lucas and writer Charles Lippincott indicated in the liner notes to the original Star Wars soundtrack, what George “had in mind was a musical background that would create the same kind of atmosphere that the scores of Erich Wolfgang Korngold had accomplished in the swashbuckling epics that had starred Errol Flynn. By the time of the second feature, The Empire Strikes Back, a change in U.S. administrations had signaled a complete reversal of political fortunes. It was Memorial Day again in May 1980, and, with the presidential election only a few months away, it started to appear that Jimmy Carter would be going up against former actor and governor of California, Ronald Wilson Reagan, a Western-like cowboy figure riding to the rescue, in big white Stetson hat and proverbial white horse. This massive upscale in the size and scope of the war — an operation designed to demonstrate the U.S.’s “credibility” — became a demonstration of misguided power and resolve. 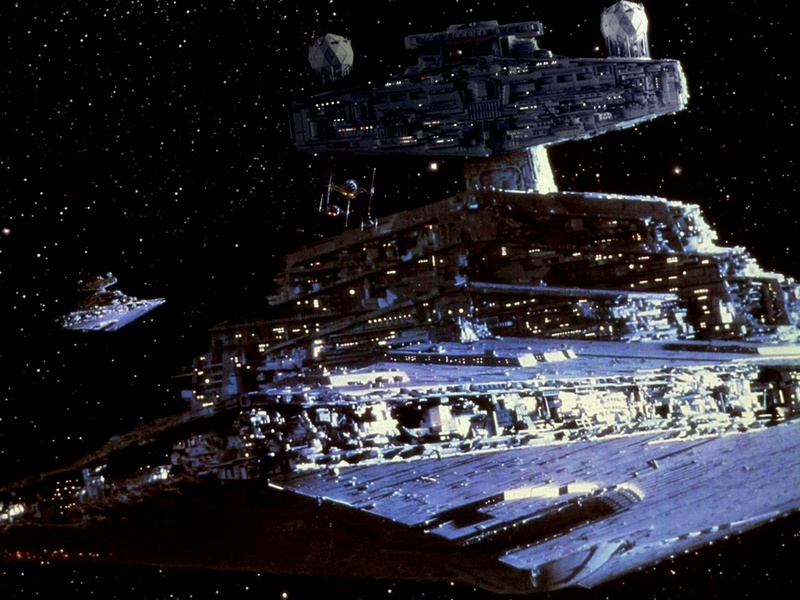 Lucas would incorporate this buildup in military firepower and might into several of his subsequent Star Wars installments, as embodied in the ongoing work of completing the first Death Star in Episode IV: A New Hope, as well as the reconstituted and “fully operational battle station” known as Death Star II (sort of a “sister star”) in Episode VI: Return of the Jedi. Getting back to Star Wars itself, Luke Skywalker was now a full-fledged knight of the Jedi realm, and equipped with a new light saber (including several upgrades) as the symbol of his power over earthy matters. The technologically inferior and seemingly incapable Ewoks — those little cuddly-bear types with twitchy personalities and hair-trigger tempers — along with metallic androids C-3PO and R2-D2, contribute, fight back, and eventually win the day for the Rebel Alliance. Three cheers for that!!! Soon, our young hero Skywalker will discover that he has his own personal challenges to face, and against the far greater strength of the Emperor himself, that traditional black-hooded bogeyman — a latter-day Grim Reaper, but without the sickle. 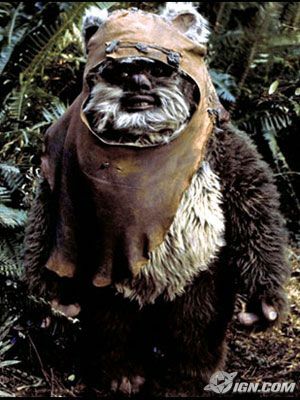 Sticking with this main point, the decidedly low-tech Ewoks present an interesting twist to the usual downtrodden situation: in order to help conquer the high-tech soldiers of the Imperial Forces, these scrappy little fighters harass and pester their foes to submission by sheer tenaciousness. After all, the inferior and illiterate Barbarians of Northern Europe ultimately defeated the Roman Republic, so why not the hapless little Ewoks? The Vietnam analogy will win out in the end, though, with the Ewoks obviously representing the united Vietnamese front (both the North and the South) fighting for their territory — and on their turf. 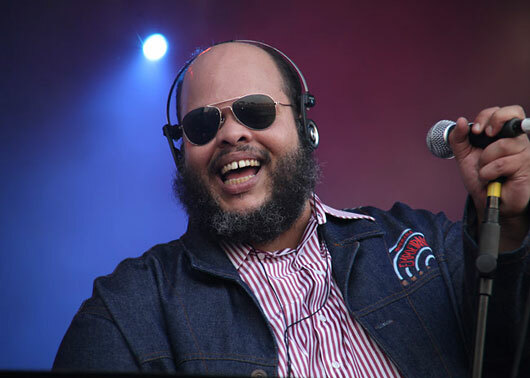 What hasn’t musician, composer, singer, jazz-soul aficionado, multi-instrumentalist, and all-around nice guy Ed Motta accomplished in his professional life? At its beginning – indeed, before there was even a “beginning” to speak of – and long before Dancing with the Stars was born, Motta made his mark on the music scene as a disco-dance contestant. He later dropped out of high school to become a vocalist with a hard-rock band named Kabbalah. He also worked as a DJ and magazine contributor; was a co-founder of the group Conexão Japeri who eventually went solo; and was a serious (and I do mean, SERIOUS) book and record collector, as well as a prolific recording and performing artist. He’s even done some animated movie work, the most conspicuous of which was providing the Brazilian-Portuguese translations (along with the singing voice) of British pop star Phil Collins’ songs for the Disney feature Tarzan. He did the same for Sting in The Emperor’s New Groove, also from Disney. But all these extracurricular activities are well known quantities to his fans. 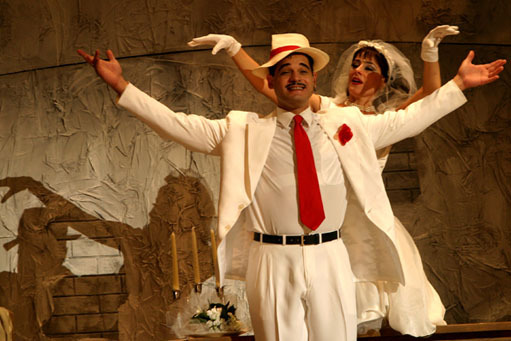 What they might not say about the wildly eclectic 41-year-old, a nephew of the late, great Brazilian soul singer Tim Maia, is his unconventional excursion into the realm of the legitimate theater – specifically, the Broadway musical theater. Well, not exactly Broadway per se, but the next best thing: the fabulous new world of Rio musicals, courtesy of the successful production team of Möeller-Botelho, the acknowledged “Kings of Brazilian Musicals” (Os Reis dos Musicais). Could The Music Man’s Professor Harold Hill have done it any better? No way! 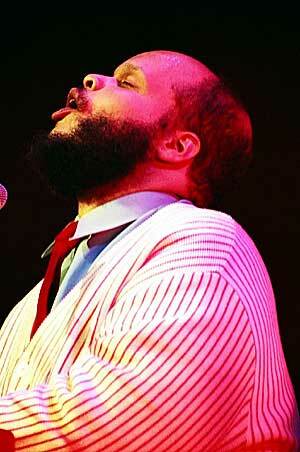 For one thing, Ed Motta is no charlatan: he’s the “real deal” when it comes to pure music-making. For another, it’s what he was meant to do all along. “I love soul, funk and jazz,” Motta told British journalist John L. Waters, of London’s The Guardian, in December 2003. “But I simply adore Broadway musicals, and I love the London cast versions. My ambition,” he went on to elaborate, “is to write a musical so that I can hear the English singers do my music…” Let’s say that he’s halfway home. 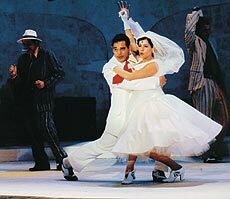 On September 1, 2007, at the João Caetano Theater in Rio de Janeiro (Motta’s hometown), Brazilian audiences bore witness to the world premiere of 7 – The Musical, its first completely original, homegrown musical hit in recent memory. Not since the bygone days of Chico Buarque’s Roda viva (“Live Roundtable”) and Calabar, or Gota d’água (“The Last Straw”), his classic collaboration with writer Paulo Pontes, or even the Brecht-Weill inspired Ópera do Malandro (“The Street Hustler’s Opera”), has there been such buzz about a musical play. 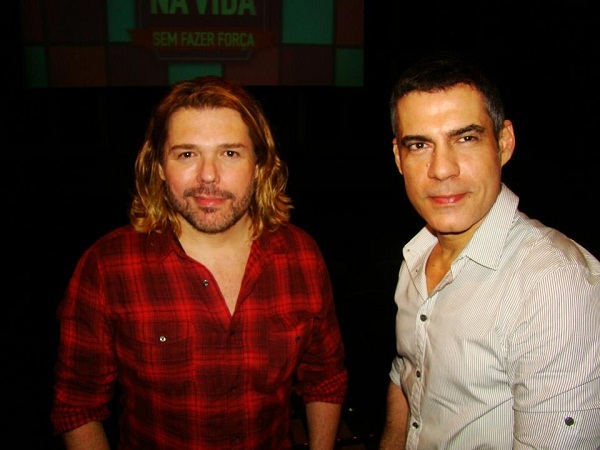 As the offspring of proud parents Ed Motta (music), Charles Möeller (book and direction) and Claudio Botelho (lyrics and musical direction), 7 would go on to become a multi-award winner and box-office champion in both Rio and São Paulo. Who would’ve guessed? So how did this extraordinary project come to pass? In February 2011, I corresponded with the work’s composer, Ed Motta, to discuss the genesis of his groundbreaking musical and how he arrived at this major turning point in his career. Josmar Lopes – Thank you, Ed, for taking time off from your busy schedule to correspond with me. Ed Motta – Wassup, Joe? JL – First off, when did you write the music for 7 – The Musical? EM – I began to write some of these songs almost four, five years before the musical. JL – Did you have any idea of its dark and somber nature? EM – I think some of the tunes do have this dark atmosphere, but there are happy waltzes and classic Broadway “Can-Can” as well. I have been writing these musicalesque tunes for a long time, usually it was just for my pleasure since my main audience knows me because of my soul-jazz tunes. JL – I’ll say! When did you decide to have Claudio Botelho and Charles Möeller build a musical play around your tunes? Whose idea was it to do this? EM – I went to see their version of Stephen Sondheim’s Company [in 2000]. I loved not just the perfect Charles timing and direction, but Claudio’s acidic and cynical lyrics that reminds me of Donald Fagen’s words and stories inside the Steely Dan architecture. JL – Is this something you always wanted to do, to write a musical-theater piece? EM – I like Broadway… I called Claudio and asked him that I really would like to show my Broadway-inspired tunes for them. They liked the atmosphere and they know the language very well, so it makes me more than proud and happy [what they did]. JL – Who got the idea of doing a story based on a modern version of Snow White? Did you have any input in the development of the plot or songs? EM – This idea was Charles and Claudio’s; I just wrote the tunes before and made some suggestions about the music. I remember the day they went to my house with the whole thing: it was God’s gift to me. JL – Fantastic! There are only six musicians in the orchestra pit, who play piano, violin, cello, drums, alto sax and bass. With the conductor, that’s seven musicians. Was there a reason such a limited number of instruments was chosen for such a big musical? EM – First of all budget, LOL. But a musical like Marry Me A Little from Sondheim has this [same] kind of minimalism regarding the orchestration. Delia Fischer, who used to be my music teacher in the 1990’s, did a wonderful job [of orchestrating 7]. It’s like some low-budget 40’s and 50’s movie soundtracks, with a little piece of the orchestra. It has a special drama and enhances the composition without the butter, LOL. JL – Describe your collaboration with Charles and Claudio, and what exactly you guys did to shape Seven into a musical. EM – My thing was strictly musical, Charles [did] the direction and Claudio, like the Renaissance man that he is, did everything else. I wrote some instrumental passages and overture, underture, etc. I worked a little bit with the original cast, singing together and playing piano. JL – Speaking for myself, I love this music! It’s so instantly recognizable and memorable! EM – Wow, God bless! JL – When I first heard the songs, I immediately knew this was Broadway material. What inspired you to write this music, especially the marvelous and catchy numbers? EM – Inspiration? My record collection with more than 30,000 vinyl LPs, and of course loads of Broadway material. And composers Marc Blitzstein, Jule Styne, Cy Coleman, Frank Loesser, Vernon Duke, and so on. Of course, Stephen Sondheim is a super influence. JL – I’m glad you mentioned Sondheim. Do you agree with the criticism that 7 sounds more like a Sondheim-type of musical rather than a typically “Brazilian” piece? JL – That’s true even today! EM – Brazilian journalists do not know a dime about Broadway, and then people come up with these crazy statements. But commercial and cheesy things have bigger audiences all over the planet, right? JL – You’re right about that as well. You have a rather eclectic taste in music, with many styles and genres associated with your name, yet you’re a relatively young man. What is it that drove you to become such a versatile artist in such a short period of time? EM – One more time I must give the credit to my record collection, to be an eBay freak buying records EVERY DAY and in many styles. Many soundtracks, musicals, rare soul, rare rock, rare reggae, but the most important thing in my collection is Jazz. My dream is to record an album with a Broadway influence [but] with a jazz viewpoint like Escalator Over The Hill from that musical genius Carla Bley. JL – Your voice reminds people of the young Stevie Wonder. Are you flattered or embarrassed by the comparison? EM – It’s a big honor for me, I love Stevie! But my main influence is Donny Hathaway, for me the best singer ever. JL – Donny is a smooth-jazz legend! You’re also a huge record collector and, as you say, you have over 30,000 records. That’s really quite extraordinary! Of all the albums that you own, what is your favorite type of listening music? Do you have a favorite artist or band? EM – Ennio Morricone is the artist that I have the most records, almost 300 LPs by him. And many, many interests, i.e. free jazz, 60’s and 70’s rock. Donald Fagen and Steely Dan are a high-water mark in my life from 25 years ago. In fact, I’m going to be 40 this year. JL – Congrats! The music for 7 is so different from your pop-influenced or funk-based work. There’s only one song, “Leva essa mulher” (“Take This Woman Now”), that I would classify as bluesy or jazzy. The rest are highly theatrical, especially “Canção em torno do defunto” (“Dance Around the Dead Man”), “Esfregando o chão” (“Scrub That Dirty Floor”), and my favorite, “O coração no bosque” (“A Heart in the Forest”). That last number was cut from the São Paulo production. I personally feel that song was a superb piece and should not have been dropped. What were your thoughts on that decision? EM – Charles and Claudio know more about what to put into a musical than I do. I have experience, but my experience is regarding music and that’s it. But I do hope the English version [of 7] will have this Morricone-influenced tune back on stage. JL – Along those same lines, it’s my understanding an entire scene was deleted from Act II: the scene of the baby. However, this is a really crucial scene. Without it, the story has a great big “gap” in the middle. There is a good deal of psychological insight in this play (thanks to Charles’ book), and this scene helps to explain much of the plot. Was there a particular reason the scene was cut? EM – I think it was because Brazilian audiences sometimes could not like something more artistic, in other words, less Ingmar Bergman and more Francis Ford Coppola, LOL. JL – Do you have any new music that you would like Charles and Claudio to adapt into a musical? Do you have any thoughts or ideas for a story? For example, would you be interested in a story based on Brazilian folklore or literature, such as Monteiro Lobato’s classic O Sitio do Picapau Amarelo (“The Ranch of the Yellow Woodpecker”)? EM – No, this is not my cup of tea. I really would like to write something noir inspired, like a Jules Dassin movie [The Naked City, Rififi, Topkapi]. Something about detectives, femme fatales, etc. JL – Since it’s obvious you enjoyed the experience, would you consider becoming a producer or director of stage musicals? EM – Wow, a producer? Too much work… My “Jefferson Airplane” lifestyle will not work with it, LOL. But I really would like to work with [musicals] again. JL – We hope you do. Once again, I want to thank you for your help in answering my questions. 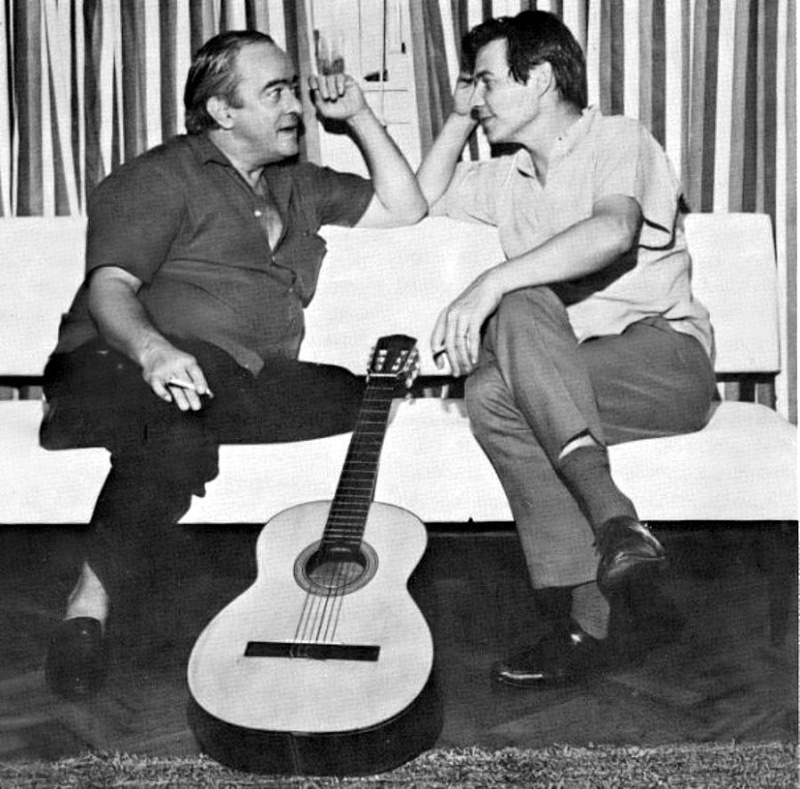 There are no existing records (at least, none that we are aware of) of Carnival taking over the lives of two of the most naturally gifted songwriting talents Brazil has ever had the good fortune to produce: composer Antonio Carlos Jobim and lyricist Vinicius de Moraes. Both hit the ground running with their very first collaboration, and hardly paused to draw breath thereafter. With the conclusion in November 1956 of their Orfeu da Conceição, both took on further challenges by throwing themselves into new work, the result of which led to an enviable (and nearly unbroken) string of song hits. “Between the years 1958 and 1965,” by writer Ruy Castro’s reckoning, “Vinicius produced close to 50 titles with Tom [alone], 40 with Baden Powell, and 30 with Ary Barroso, Moacyr Santos and others,” to include such promising newcomers as Carlos Lyra, Edu Lobo, Francis Hime, and Toquinho. Researcher Sérgio Ximenes put the total for Tom at “over 250 works, with 29 albums recorded under his own name,” and as a guest artist or participant in approximately 37 more. Severiano cites such supreme examples of his art as “Águas de março” (“The Waters of March”), “Chovendo na roseira” (“Double Rainbow”), “Matita perê” (“Song of the Thrush”), “Passarim,” Borzeguim,” “Chansong” — a play on chanson, the French word for “song” — “Anos dourados” (“Looks Like December”), “Sabià,” “Retrato em branco e preto” (“Portrait in Black and White”), and those pretty little ditties with ladies in their titles (“Ana Luiza,” “Bebel,” “Lígia,” and “Luiza”). The more songs the tunesmith turned out, it would seem, the more accomplished he became at it. The only thing that Jobim had failed at evolving was an appropriately thick skin to go with his compositional flair, something not even his most frequent working partner Vinicius had bothered to grow over a lifetime of living large in the public eye. According to the composer’s self-analysis, timidity is the word that best described his reticent comportment around others. But be not deceived: Tom was no pushover when it came to defending his artistic turf; neither did he find it necessary to berate the opposition in the same demonstrative mien The Little Poet loved to exhibit. Audacity, intuition, curiosity, duality, obstinacy, unconventionality, and universality were the other key attributes of Jobim’s personal makeup, and they undoubtedly showed. These were the same baseless accusations that had dogged the footsteps of the late Carmen Miranda in her prime, the kind that forced the popular entertainer to pull up stakes in her home country and go seek her fortune elsewhere (in the United States, to be exact). Now they were winding their insidious way into Jobim’s world as well. He was even accused at one point of adopting the American form of “Tom,” a nickname younger sister Helena had tagged him with as a boy, as proof of his outside aspirations. For a man whose middle name also happened to be Brasileiro (Portuguese for “Brazilian”), this was a savage blow indeed to his integrity and self-worth. 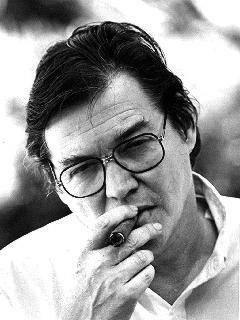 Overcoming his own well-documented reserve, Jobim seriously contemplated putting out some sort of riposte while maintaining his vaunted coolness under fire, even in the face of mounting critical concerns. Tom was quite beside himself to hear how Americans had taken to the harmonically advanced chord progressions he and Vinicius hammered out for their chart-busting single, “The Girl from Ipanema” from 1963,* thanks ever so much to saxophone great Stan Getz and the sensuous come-hither sounds (speaking of Latin heat) of Astrud Gilberto. Their recording came in at Number Five on the Billboard Top Pop of 1964, while reaching Number One on the Adult Contemporary scene. It was kept under wraps for a solid year before being released into a market dominated by The Beatles, The Beach Boys, The Supremes, The Rolling Stones, and other formidable folk. For now, there was no jumping off the bossa-nova bandwagon. On the contrary, Jobim was more anxious than ever to hold on for dear life and keep the mutual admiration society going. “More and more,” his little sister acknowledged, “Tom respected the U.S. as a country that received, with open arms and without prejudices, artists from all over. He felt himself a citizen of the world there,” and with good reason. From 1963 until his death, in December 1994, of heart failure following surgery for bladder cancer — another uncanny reference to his hero, Villa-Lobos — Jobim divided his time between the American East and West Coasts, and the southeastern tip of Brazil. While in the States, he recorded many of his most fondly remembered works (including two classic sessions with Sinatra) for Warner-Reprise, as well as for the strictly jazz label Verve and the R & B-based A&M Records. His two pet projects, the albums Matita perê (1973) and Urubu (“Vulture,” 1976), were roundly rejected in Rio but eventually picked up here by MCA and Warner, in that order. Having gone their own way since the middle of the 1960s onward — the motive behind the amicable split being Moraes’ need to share his poetic insights with other, lesser-known adherents — the once inseparable duo reunited as a quartet in September 1977 for a now-historic series of concerts. 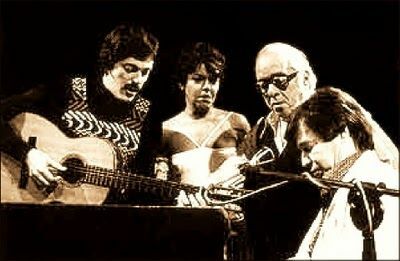 Backed by Toquinho, Vinicius’ then-current touring partner, and Chico Buarque’s sister, Miúcha (recently wed to the equally hermetic João Gilberto), the group played Rio’s Canecão nightclub for seven straight months, then took their show on the road to such places as São Paulo, London, and Paris. Ruy Castro recounts, in his fact-filled tome Ela é Carioca: Uma Enciclopédia de Ipanema (“She’s a Carioca: An Encyclopedia of Ipanema”), one of the high points of their encounter: the nostalgic “Carta ao Tom,” followed immediately by its parody, “Carta do Tom” (“Letter from Tom”), in which the composer and his lyricist Chico bemoaned the loss of innocence once associated with Ipanema’s tranquil, middle-class neighborhood. * From F-sharp major at the words “Oh, but I watch her so sadly” and on “How can I tell her I love her?” to G minor at “Yes, I would give my heart gladly,” back down to A major with “But each day when she walks to the sea,” ending on D major, then G major for “She looks straight ahead,” and finally returning to F-sharp major on “not at me,” in Norman Gimbel’s sultry English-language verses. ‘Ópera do Malandro’ (‘The Street Hustler’s Opera’): What’s It All About, Max Overseas? 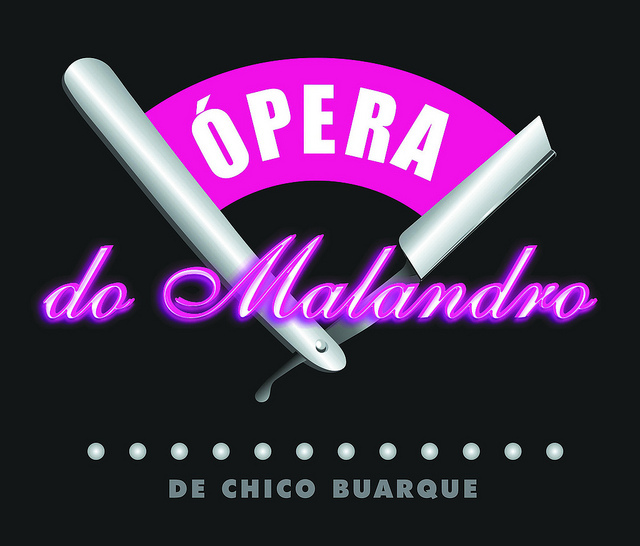 The most well-known of singer/songwriter Francisco (“Chico”) Buarque de Hollanda’s musical plays for the Brazilian stage, Ópera do Malandro (or “The Street Hustler’s Opera”) is based in large part on The Beggar’s Opera (1728), an English ballad opera attributed to poet and dramatist John Gay; and The Threepenny Opera (1928), conceived by playwright Bertolt Brecht with composer Kurt Weill. The original show premiered in Rio de Janeiro in July 1978, and was subsequently introduced to São Paulo, in October 1979, under the direction of Luiz Antonio Martinez Correa. It has since been revived a number of times throughout Brazil and Portugal, particularly during 2003-2004 by the award-winning production team of Charles Möeller and Claudio Botelho. Fernandes de Duran – an enterprising merchant, moneylender and bordello owner. Fichinha (“Easy as Pie”) – a recent “recruit” from the North of Brazil. Vitoria Regia – Duran’s wife, a fanatical social climber and former madam. who plays both sides of the fence, as befits his dual nature. Teresinha (“Little Teresa”) – the Durans’ spoiled-rotten daughter, in love with Max. Max Overseas – the malandro of the title, a smuggler, thief and master con man, in addition to being Public Enemy Number One. Inspector Chaves – called “Big Tiger,” the chief of police and friend to Max; he happens to be on the con man’s payroll, but who also works for Duran on the side. Lucia – Inspector Chaves’ daughter, in love with (and made pregnant by) Max. The setting is the old bohemian district of Lapa, in Rio de Janeiro. The time is the early 1940s, during the dictatorship of Brazilian strongman Getúlio Vargas. Although the story takes place during this period, the setting and action are, in reality, sharp-eyed reflections on Brazil’s military government years of the late 1970s and the growing dependency on foreign (read: American) corporate interests and influence. Merchant and moneylender Fernandes de Duran and his social-climbing wife, Vitoria Regia, run a successful operation of houses of ill repute, among other questionable activities, employing hundreds of fallen women as workers in their “boutique,” thus keeping them out of “trouble.” The couple has a daughter, Teresinha (“Little Teresa”), who has been brought up to lead a rather sheltered life – or so they believe – away from the cruelty and want of this world. Duran and Vitoria have done their best to seek an advantageous match for their only child. The couple’s silent partner, Inspector Chaves, the dreaded chief of police, is in charge of the so-called morals of the city. By sheer coincidence (or perhaps not so coincidentally), Chaves supplements his measly police earnings by accepting gifts, grafts and gratuities not only from Duran but also from his friend and ally in crime, the notorious smuggler Max Overseas. At the same time, Max lords it over his enterprising band of hoods, known collectively as malandros (“street hustlers”), that operates in the vicinity – and without too much interference from the law, thanks to his pal Chaves. Business is thriving, until the day all three of these men cross paths with each other. That’s when the real fun begins! Scene One: Duran’s office home. Fernandes de Duran, zealous guardian of “law and order” (as he sees it), is talking to Inspector Chaves on the telephone. Duran is calling in his debt: he informs Chaves that the end of the month is at hand, but the police chief’s monthly payment is long overdue. After interrupting the phone conversation with repeated knocks on the door, Fichinha sashays into the room. A young girl from the impoverished North, she has been sent to him from a nearby jail, allegedly for loitering and soliciting. After getting the impression she is probably the most clueless individual he has ever met, Duran offers her a job in his boutique. He thinks she has definite “possibilities” in the call-girl profession. Scene One: Back at Max’s hideout. Teresinha enters to tell Max that his “old buddy,” Big Tiger Chaves, is coming by to arrest him, under pressure from her dad, the now furious Duran. At first Max laughs off her entreaties, but soon realizes that she is deadly serious. 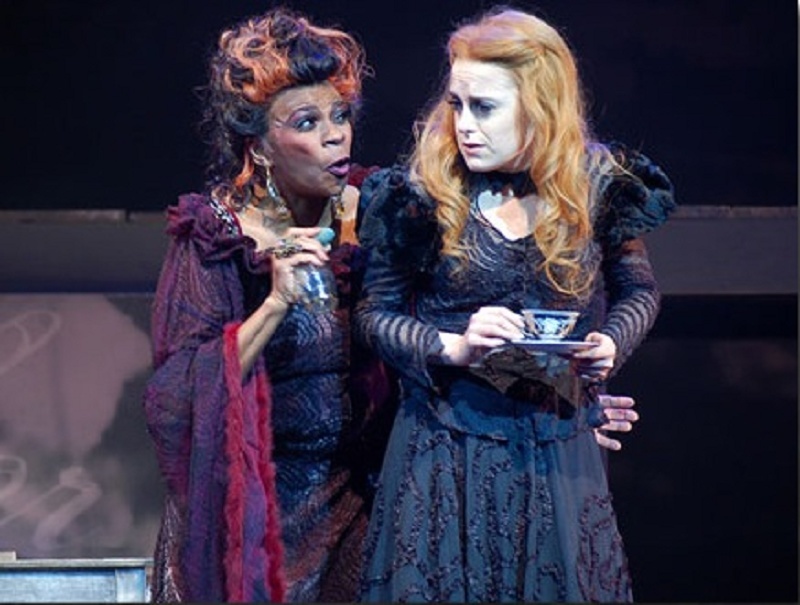 Teresinha promises to take care of Max’s “business interests” in his absence, while Max decides to lay low for a spell. He summons the malandros to announce that he is taking a vacation from his chores and promptly runs off, leaving Teresinha in charge of his henchmen. No sooner has she taken over, when she gets immediate resistance from Max’s boys – one of whom, Barrabas, is “fired” for insubordination. He is promptly shown the door, but on his way out Barrabas vows that he will be reinstated in the end. Teresinha’s retort is that, given a choice between Barrabas and herself, Max will choose her every time. “Are there any other complaints?” she asks. At the end of his song, he tells Duran, Chaves and Vitoria where they can find Max. They beat a hasty retreat, as Geni, exhausted, is left fanning himself on the couch. Scene Five: Back at the jail. Recaptured, Max knows it’s the end for him. He runs into his old gang member, Barrabas, who is now on the side of the law – no thanks to Teresinha. Not even a visit from Teresinha can snap Max out of his dark mood. What Teresinha tells him, though, is that she’s been able to clear all his debts with loans obtained from legitimate sources. In fact, Max’s entire “fortune” which he had earlier placed in her loving hands (along with the combination to his safe) is gone. The money has now been invested in American multinational firms. Max also learns that he is the sole proprietor of an officially registered corporation called MAX-TERTEX. Max does not feel well at all. For the first time in his life, he is feeling fear.